| 1—Robeson County, NC Deeds (a series) dated 1823-1838 showing the children of John McNeill who lived near Moody Bay on Richland Swamp dividing the estate over time. | 2—Robeson County, NC 1833 will of Flora McNeill naming her children. Some are the children of his first marriage. | 3—Angus Black family bible records | 4—Robeson County, NC deeds indicate that John's four oldest sons were buying land as early as 1785, too old to have been the sons of Flora McMillan, John's second wife who bore John's last child in 1812. John and Flora married about 1792. | 5—Robeson County, NC marriage records. | 6—Peggy Townsend's "Vanishing Ancestors", Vol. 1, p. 6, the McBryde cemetery. 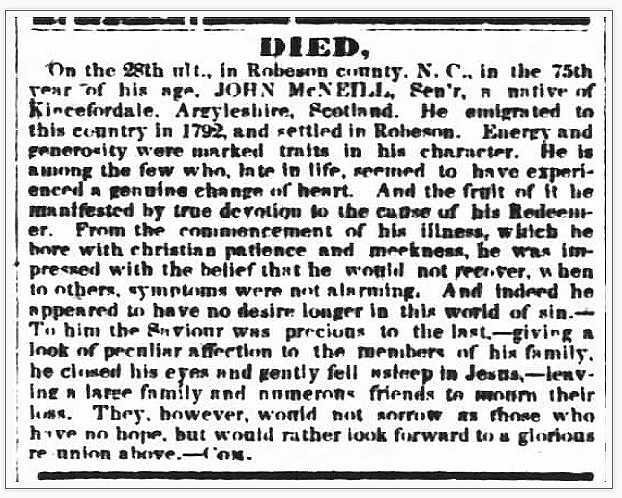 | 7—Obituary for John McNeill of Keinfordale, 1850| 8—Philadelphus Presbyterian Church cemetery. | 9—U.S. Census Records for Robeson County, NC. 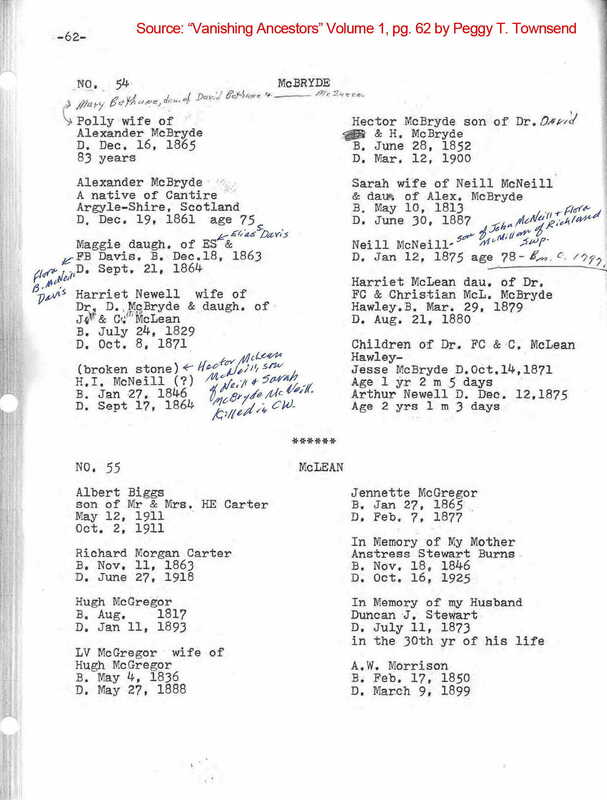 | 10—Both estate settlements for Hector McNeill and Isabella McNeill (man and wife) in Richmond Co., NC, Robeson Co deeds, and the death certificate for their daughter Catherine Isabella who died in 1928. | 11—Robeson County, NC court minutes for 1804.| 12—Records of County, Georgia. Father (Archibald McNeill, died 1804?11) Mother ? Notes on this Family : This family has been referred to as the Richland Swamp McNeills but no research of any merit has ever been done to determine who they all were. Robeson County deeds are the key to placing this family amongst the McNeills of the region. According to the will of John's 2nd wife Flora, his father is buried somewhere nearby. Hs father may have been the Archibald McNeill who died in Robeson County in 1804 (per Robeson County court minutes) and for whom there are no other existing records. Regarding Flora McMillan, her maiden name is known by a provision in her will that directs her son to put up markers to her brother Duncan McMillan's grave, as well as her husband's and his father's. It appears Flora was John's second wife because his oldest sons are buying land as early as the mid-1780s. John may have bought these lands for them as little boys and attached their names to the deed--this kind of thing did happen, though not often--in which case Flora McMillan may have been their mother. Some of these early deeds, however, are witnessed by men who appear to have been relatives/brothers to the buyers. So the simplest and most likely explanation is that the four oldest sons were the sons of a previous marriage. Regarding John's and Flora's daughter Isabella, her part of her father's estate was the slave Emily and 100 dollars. Emily is found in the 1854 estate settlement in Richmond County, NC, of Isabella McNeill, the wife of Hector McNeill who had died the year before. Their daughter Catherine Isabella (Kate I. McNeill who never married) died in 1928 and her death certificate states her mother Isabella McNeill was born in Robeson County. Regarding John's and Flora's daughter Elizabeth, she accepted the slave Amy and money as her part of her father's estate, afterwards moving with her husband Turquill to Dent Co., Missouri, taking Amy with them where she died long after the Civil War and was buried with them in their family plot; the family to this date remember Amy in their family tradition. Mary Ray, 24 Nov 1823;5 and they moved to Sumter County, Georgia12; was she a dau. of Angus Ray? Had several children. Margaret McMillan; about 1805; dau. of John McMillan & Margaret McNeill5. Had several children. Effie Murphy; daughter of Archibald Murphy5. Had several children. Sarah McBryde; about 1837; daughter of Alexander McBryde & Mary Bethune5. Had several children. Never married5; favorite aunt of Mrs. Kate E. McNeill Smith. Turquill McNeill; about 18261 moved to Dent Co., Missouri; son of Malcolm McNeill & Nancy McNeill. Had several children. Alexander Varnum, 11 Dec 18415; three children, Sarah Catherine, John A., and Oliver.